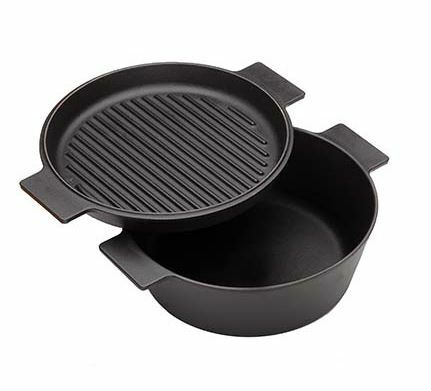 A fantastic cast iron casserole with grill pan lid - 2 pans for the price of 1! Easy to use and easy to clean, it will give you years of service. *A handling fee of £17.50 per item will be added to your shipping total at checkout. A fantastic inheritance piece - a sturdy cast iron casserole dish with a griddle lid and able to contain 1.7 litres so big enough for family cooking. Perfect for overnight braises and slow cooking - casseroles, stews, curries, chillies; a pan to use every day. We clean ours in hot soapy water and then put it back in the cooling woodfired oven to really dry out.